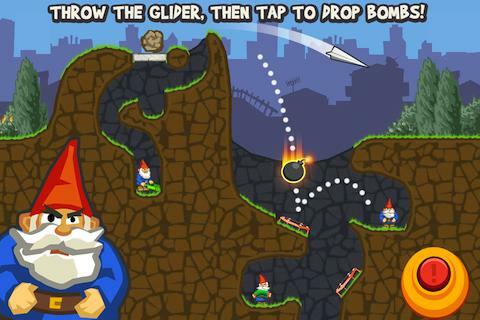 Paper Glider vs Gnomes: Help Paper Glider to rid the world of the vulgar Gnomes! Gameplay: The aim is to throw a paper aeroplane by flinging your finger across your screen. As it glides over your target you want to tap on the screen to release a bomb which will then drop and roll to your target. 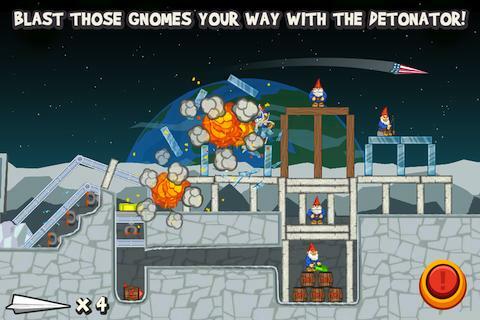 Fingers crossed, your resultant explosion will wreak havoc and smash the gnomes to pieces. As you progress through the levels, the puzzle element becomes harder and you need to adapt to the terrain and focus on your glider throws. In this physics game they’ve packed in some other special objects like buttons, springboards and flippers… this is all on top of their paid for content which gives a huge amount of playing variation (different planes, and bombs etc). Gnome haven: The menus, graphics, and loading screen captions are actually the parts which capture our attention the most. The statements that the gnomes have inbetween loading screens are pretty darn awesome, and give the guys at Neonplay a huge amount of character. Our review is slightly abstract, in that it hasn’t actually covered what’s good about the game… well that’s the thing… For me personally, I’ve found it so difficult to get into this game. The realistic, slow and gentle paper plane saps all the energy and excitement away. When I throw wrong or drop my bomb incorrectly (to mess up my three stars) I instinctively restart the level, but it seems to take forever to restart a level. Instead I have to look at that stupid gnome and read his gimmicky advertising statements for ages. Don’t get me wrong, the physics is amazing, but the time to restart a level is annoyingly long. Rating: 3/5 A good new physics puzzle concept which has great potential. The graphics and setup are generally all pretty good and ooze with game polish… but its all let down by seriously long loading times. If you do want to fully enjoy this game, then perhaps you should consider buying the various components which the gnomes can’t stop banging on about.